Young barley leaves and wheat grass are excellent natural sources of chlorophyll, minerals, vitamins, and insoluble fiber. Chlorophyll acts as an anti-inflammatory, antibiotic, deodorant, and antioxidant. It has been successfully used in the treatment of chronic ulcers, bad breath, and oral diseases. It reduces flatulence and body odor and eases chronic constipation. Chlorophyll has been shown to alleviate infections of the lungs and sinuses. It hastens wound healing, and has been used to treat kidney stones. When taken with antibiotics, chlorophyll induces rapid recovery from secondary invasive infections. Chlorophyll has been demonstrated to have radioprotective, anti-mutagenic, and anti-carcinogenic activities in laboratory studies. 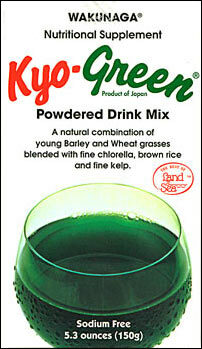 Kyo-Green is a convenient and good-tasting powdered drink blend that has barley leaves and wheat grass as key components. Another important ingredient in Kyo-Green is chlorella, an alga that is rich in chlorophyll; it has been shown to improve the healing of stomach and duodenal ulcers, as well as chronic gastritis. Chlorella regulates cholesterol, has anti-tumor effects in animals, and enhances phagocytic activity as part of the immune response against infections. Kyo-Green also contains kelp, a brown seaweed that lowers blood pressure and cholesterol and has displayed anticoagulant and fibrinolytic activities. Kelp has also been shown to reduce elevated blood sugar levels. Like chlorophyll, kelp has demonstrated anti-mutagenic activity and it has been shown to reduce the incidence of chemical-induced tumors in animals and to inhibit the growth of implanted tumors in mice. Kelp also displayed anti-viral and antioxidant activity in laboratory studies. Laboratory analysis confirms the product to be gluten free. Mix 1-2 teaspoons of powder with 8-12 ounces of juice or water for a tasty refreshing drink. It can be consumed as frequently as desired. The table on the next page presents the content of nutrients and other ingredients of the juice, which is an useful addition to a diet that includes green vegetables. Vitamin A (as Beta-Carotene) 450 I.U.